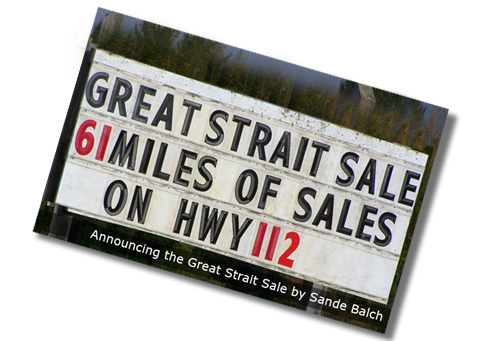 The Great Strait Sale, first held in 2008, is a 61+ mile long series of yard sales, business specials, art and crafts sales and fundraisers along the length of the Strait of Juan de Fuca Hwy 112, a National Scenic Byway. The scenic byway runs from the junction of highways 101 and 112 at the east end to Neah Bay at the west end. The event originated as an opportunity for the Hwy 112 community to participate as a whole in an activity that would draw people from all the neighboring communities and introduce those visitors to what the Strait of Juan de Fuca businesses and landscape has to offer. 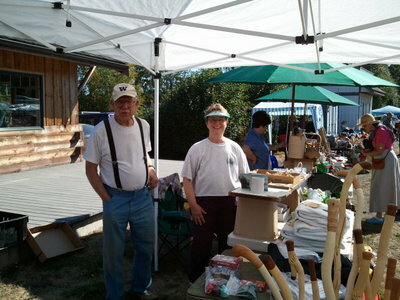 The areas of Joyce, Clallam Bay/Sekiu, and Neah Bay each have a community site set up welcoming sales to join together flea market style at the site. Hwy 112 residents are encouraged to hold sales at their own homes or in their neighborhoods along the route. Businesses advertise specials or discounts available the day of the event. And civic groups often join in with fundraisers. Fliers are created each year with paid ads and a milepost map of advertised sales. The fliers are available in advance of the event at an announced location as well as on the web site at www.highway112.org. The community sites distribute fliers the day of the event. It is a community-building event … a “fun-raiser”. 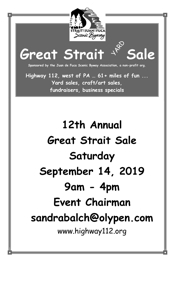 It’s the Great Strait Sale happening each year on the 2nd Saturday in September. Make it safe. Make it fun. Make it a clean sweep.